As most of you are aware, Halloween is just right around the corner. It’s a time where children dress up as imaginary creatures and go around knocking on doors, hoping that their reward will be candy. Growing up, I was never allowed to participate in the tradition of dressing up and trick or treating. I remember my parents telling me that on this night, whenever a knock was heard, we weren’t allowed to open the door. I didn’t understand it at the time; I just thought Halloween was a universally accepted holiday, like Christmas or Easter. But now, I understand why my parents were so cautious about this one particular night. And I think it’s important that all Orthodox Christians – especially children – should understand the meaning behind Halloween. 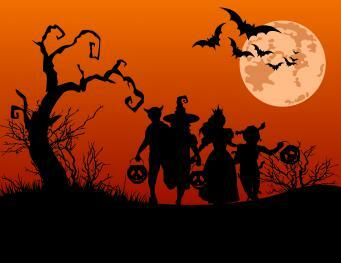 Halloween, or All Hallows’ Eve, is a tradition that began in the pre-Christian times. The Celtic people, who were commonly pagans, believed that ‘life was born from death’. Thus, on the last day of October, they worshipped a deity called Samhain (pronounced sow-in), otherwise known as the Lord of death. On this night, sacrifices – animals or human – were made in order to appease Samhain, who in turn would lower the veil between the living and the dead, allowing the lost ones to be reunited the living for one night. The festival also included a bonfire of oak branches where the sacrifices were made and other rituals performed. Moreover, the custom of ‘trick or treat’ originated from people – in costume - visiting houses in exchange for food, so that the hunger of the dead would be satiated. If Samhain was not pleased with the offering, ‘tricks’ or curses would befall on those visitors. It doesn’t sound very innocent, does it? The trouble with Halloween is that because of society, it has become heavily commoditised, shrouding the true meaning and covering it with money and profits. This makes it easier for children to see Halloween as a way to spend money and have fun, while ignoring the warnings. Fortunately, I haven’t experienced a traditional Halloween night, unlike the parades in Greenwich Village in the United States, and I don’t plan to. It feels wrong going against my belief in order to celebrate and revel in a night of darkness in order that a satanic deity could be appeased, all because everyone else around me is doing it. That’s another problem with Halloween; it has become readily accepted by society, that it puts pressure on faithful Orthodox Christians to succumb to the temptation and darkness of Halloween. It puts pressure on Orthodox children to follow their peers’ footsteps, because to them, it’s ‘cool’. But we shouldn’t feel pressured to explain to our peers that we don’t celebrate Halloween because it goes against our faith. They should learn to embrace our values and respect our decisions, just as they expect us to respect their decisions. Halloween is a pagan tradition that seeks to appease a satanic deity, and Orthodox Christians must learn to defend themselves against those who attempt to draw us into this celebration of evil. 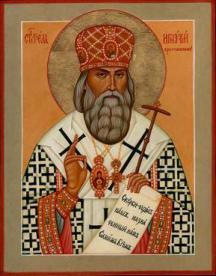 Editor’s note: Orthodox Christians would do best to attend the All-night Vigil in honour of St John of Kronstadt on Friday night, rather than participate in pagan festivities! We live in a sea of vulgarity. Vulgarity is threatening to become a way of life. This explosion of vulgarity destroys the sanctity of life; it negates all that is holy, all that is beautiful, and all that is true. We are experiencing an aesthetic and spiritual tragedy, wherein it appears that everything is yielding to the allure of vulgarity and immorality. …by vulgar we mean a lack of nobility and discretion, a lack of decorum and modesty…. By vulgar we mean what is crude, offensive, coarse, indecent, and vile…. Our responsibility before God and history is enormous, since we, —the “earthen vessels”—have been called upon to preserve, by the Grace of God, human dignity. Fight against the kingdom of vulgarity! 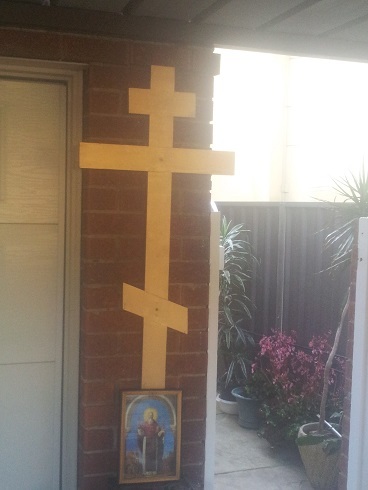 The parish of St John of Kronstadt in Sydney will be celebrating its Church feast this coming Saturday (19.10/1.11). All are welcome to attend. 31.October - Friday evening - All-night Vigil: 6 pm. 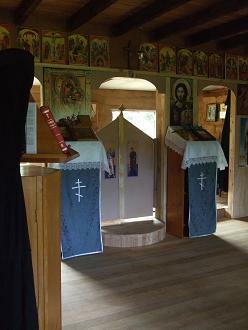 Parish of the Holy Righteous John of Kronstadt. Sydney, Australia. Сидней (Австралия) Приход в честь Cв. Прав. Иоанна Кронштадтского. For more details, please contact the rector, Fr Nebojsa Mirkovic. Life on earth will never be free from temptation. 41. We should not demand that all brothers in Christ who in one way or other, upset our peace of soul with their words, be silenced. It is for individual Christians to resist individual temptation. It is the duty of each believer to resist temptation and reject evil. No other person can perform this spiritual struggle on behalf of the Christian. The believer should take advice from his spiritual father on how to struggle. However, no spiritual father can live the spiritual life “on behalf of” his spiritual child. 42. The duty of a Bishop and other clergy is to teach according to the Gospel, to teach Christians the path to God, and how to resist temptation. However, they do not have power to remove all temptation from the Church on earth (the Church Militant). Indeed, if they did – how could we be saved? How could we prove our love for God? If there was no one to forgive, how could we fulfill the commandment to forgive? If there were no difficulties to bear, how could we fulfill the commandment to be patient? 43. Only the Church Triumphant (that is, the Church in Heaven, consisting of all the Saints of all times who have reposed, and all the sinners who have obtained forgiveness) is free of temptation. 44. Let the Christian be glorified for his virtues of love, prayer, peace, forgiveness, and fidelity to God rather than to man. I wrote unto you in an epistle not to company with fornicators: Yet not altogether with the fornicators of this world, or with the covetous, or extortioners, or with idolaters; for then must ye needs go out of the world. But now I have written unto you not to keep company, if any man that is called a brother be a fornicator, or covetous, or an idolator, or a railer, or a drunkard, or an extortioner; with such an one no not to eat. For what have I to do to judge them also that are without? do not ye judge them that are within? But them that are without God judgeth. Therefore put away from among yourselves that wicked person. 46. The only sinners the Church with a definite, authoritative voice commands us to separate from, are heretics. The local and Ecumenical Councils, anathemas and writings of the Holy Fathers define what opinions are heresy. The Bishops of the Church teach what is heresy. Other opinions are not heresy, but rather, private opinion, which is tolerated in the Church. Opinions are tolerated, even when they are tainted by some element of sin, because the Church wishes to save all sinners. 48. 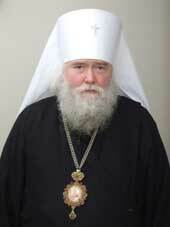 The Church requires obedience – submission to a lawful Orthodox hierarch who is correct in his dogmatic beliefs. Nevertheless, even such a Bishop may have some opinions that are passionate, and he may sin at times. These imperfections do not give the Christian a right to separate from the Bishop. Only if a hierarch teaches heresy, or is in communion with heretics, do the faithful have a right (or indeed, an obligation) to leave him. 49. The Church is based on grace, not on unity of opinions or uniformity of life. The Holy Spirit unites and permeates the Body of the Church, and to the degree we partake of the Holy Spirit, we also are united with the Body of Christ, and live in Christ. 50. To the degree we sin, we separate ourselves from the Holy Spirit and lose Grace. Next, we are deprived of the spiritual gifts of love and hope. This leads to the sins of hatred and despondency. Oftentimes in history, hatred and lack of hope have served as pretexts for schism in the Church. Fear this path! God’s providence has appointed this time for us sinners. 52. If everything that God allows us to go through is for the good of our soul, then the struggle that the Church presently is going through, is also for our salvation. We should rejoice that God wishes to save us. God is powerful to save every sincere believer through this temptation. Indeed, without temptation, we cannot be saved! God has appointed us to live in this evil time, with its temptations, because it is necessary for the salvation of our sinful souls… By going through this, and every temptation in our life, with the mind of Christ, repentance, hope in God and love for our brothers, we will be saved. Our salvation depends on how we handle temptation – with humility, or with pride and bitterness? This is our Cross, which we must not reject. There is no other path to Heaven than the Cross! A trial of the latter times? 53. Finally, let us understand that soon enough, Christ will judge us all, and Satan will be finally defeated. He has only been loosed for a very short time to tempt the world, so that the true Christians can prove their love for God. The thousand years of his binding are the time of the Church, when people can save themselves in relative peace (though not without temptation!). In these figurative thousand years, the devil and his servants disturb the world only peripherally, and the Church reigns spiritually over Her children, and through them and their exalted spiritual life, over the whole world. 54. 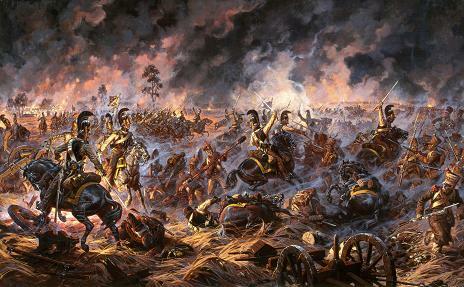 Towards the end of time, Satan will conduct great warfare, particularly against the elect - the Christians. …to seduce, if it were possible, even the elect. Many eagerly observe our times for signs of the end. These signs of war, hatred, upheavals and division have often been present - but in our times, they are ever-present. In addition our times display an even more sure sign: Universal unbelief. 55. All revolutions and civil wars are extreme forms of evil where brother kills brother. With all social and political upheavals, the Evil One aims to distract and disturb us from our own personal war with him and his temptations. Brothers! It is necessary for us to be very sober. 56. When we by our words or writing produce disturbance and destruction of love in others, we participate in evil. Those who write and speak will have to answer to God for every word! And those who read with interest, disseminate, and discuss, will also have to answer to God for every word, every minute they spend in passionate interest, rather than in love for God and their brothers. I look at the world, and I see that the nets of the devil have increased, in comparison with the early times of the Church of Christ, they have increased innumerably; The number of books that impart false knowledge have increased, the number of minds that contain and proclaim false knowledge to others have increased; The number of followers of Holy Truth have decreased, decreased to an extreme degree; the respect for natural virtue has been strengthened, the virtue which is open to Jews and pagans; respect for directly pagan virtues has appeared, which are contrary to nature itself, which nature itself sees as evil; I cannot even express how the understanding of Christian virtue has decreased, and active doing of virtue has been nearly completely destroyed; physical life has been strengthened, spiritual life is disappearing, fleshly pleasures and cares devour all time, there is no time to even remember God. And all this is turning into an obligation, to a law. “And because iniquity shall abound, the love of many shall wax cold” (Matthew 24:12), and also the love of those who would otherwise have remained in love for God, if evil was not so every-present, if the nets of the devil had not increased to such an infinity. The sorrow of St Anthony (when the devil showed him his nets, which were spread out to catch people) was justified. Even more justifiable is the sorrow of a Christian in our times, when he sees the nets of the devil; well-founded is the sorrowful question: “Lord! Who, of all the people, will be able to escape these nets and find salvation? This question of the venerable desert-dweller was followed by an answer from the Lord: “Humility of wisdom (смиренномудрие) will escape all these nets, and this they cannot even touch”. I arose and saw near the window glorious starets (elder) with frosty grey hair, wearing a black mantia, and holding staff in his hand. He looked at me tenderly, and I could scarcely keep from falling because of my great fear. My hands and feet trembled, and I wanted to speak, but my tongue would not obey me. The starets made the sign of the cross over me, and calm and joy soon came over me. Then I made the sign of the cross myself. He then pointed to the western wall of my cell with his staff in order that I should notice certain spot. The starets had inscribed on the wall the following numbers: 1913, 1914, 1917, 1922, 1924, and 1934. Again I saw a large group of infants who had suffered for Christ under Herod and had received crowns from the Heavenly King. We walked further and went into large church. 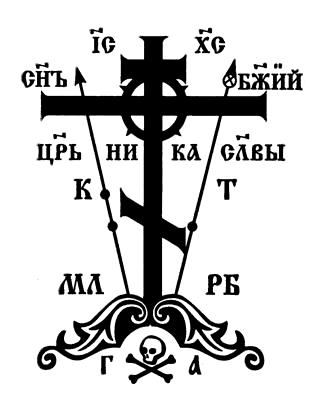 I wanted to make the sign of the cross, but the starets said, ‘It is not necessary to cross yourself because this is a place of abomination and desolation!’ The church was very gloomy. On the altar was a star and a Gospel book with stars. Candles made of tar were burning and crackling like firewood. The chalice was standing there covered by strong stench. There was prosphora with stars. A priest stood before the altar with face like pitch and woman was under the altar covered in red with a star on her lips and she screamed and laughed throughout the church saying, ‘I am free!’ I thought Oh, Lord, how awful! The people, like madmen, began to run around the altar, scream, whistle, and clap their hands. Then they began to sing lecherous songs. Suddenly lightning flashed, frightening thunderbolt resounded, the earth trembled, and the church collapsed, sending the woman, the people, the priest, and the rest into the abyss. I thought Oh Lord, how awful, save us! The starets saw what had happened as did I. I asked, ‘Father, tell me, what is the meaning of this frightening church?’ He responded, These are the earthly people, heretics who have abandoned the Holy, Catholic, Apostolic Church and recognized the newly innovated church which God has not blessed. In this church they do not fast, do not attend services, and do not receive Holy Communion!’ I was frightened and said, The Lord has pity on us, but curses those with death!’ The starets interrupted me and said, ‘Do not mourn, but just pray!’ Then I saw a throng of people, each of whom had a star on his lips and was. terribly exhausted from thirst, walking here and there. They saw us and yelled loudly, ‘Holy Fathers, pray for us. It is very hard for us because we ourselves cannot. Our Fathers and Mothers did not teach us the Law of God. ‘We do not even have the name of Christ, and we have received no peace. We rejected the Holy Spirit and the sign of the cross!’ They began to cry. Soon everything became hidden in the fog. I cried bitterly praying for the Tsar-martyr. My hands and feet trembled from fear. The starets said, :Look! Then I saw a throng of people scattered about the land who had died from starvation while others were eating grass and vegetation. Dogs were devouring the bodies of the dead, and the stench was terrible. I thought, Oh Lord, these people had no faith. From their lips they expelled blasphemy, and for this they received God’s anger. We proceeded further, and the starets quickened the pace so that I could hardly keep up with him. ‘Look!’ he said. I saw a large crowd of people being persecuted by demons who were beating them with stakes, pitchforks, and hooks. 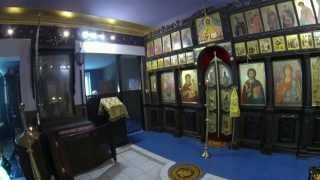 I asked the starets, ‘What is the meaning of these people?’ He answered, These are the ones who renounced their faith and left the Holy, Catholic, Apostolic Church and accepted the new innovative church. This group represents priests, monks, nuns, and laymen who renounced their vows or marriage, and engaged in drinking and all sorts of blasphemy and slander. All of these have terrible faces and a terrible stench comes from their mouths. The demons beat them, driving them into the terrible abyss, from where hell fire comes forth. ‘ I was terribly frightened. I made the sign of the cross while praying, Lord deliver us from such a fate! I then saw a group of people, both old and young, all of whom were terribly dressed, and who were raising a large, five pointed star. On each corner were twelve demons and in the middle was Satan himself with terrifying horns and a straw head. He emitted a noxious foam onto the people while pronouncing these words, ‘Arise you accursed ones with the seal of the beast..’ Suddenly many demons appeared with branding irons and on all the people they placed the seal: on their lips, above the elbow and on their right hands. I asked the starets, ‘What is the meaning of this?’ He responded, This is the mark of the Antichrist!’ I made the sign of the cross and followed after the starets. He suddenly stopped and pointed to the east with his hand. I saw a large gathering of people with joyous faces carrying crosses and candles in their hands. In their midst stood a large altar as white as snow. On the altar was the cross and the Holy Gospel and over the altar was the vosduch with golden imperial crown on which was written in golden letter, ‘For the short term.’ Patriarchs, bishops, priests, monks, nuns, and laymen stood around the altar. They were all singing, ‘Glory to God in the highest and peace on Earth’ Out of great joy I made the sign of the cross and praised God. Suddenly the starets waved his cross upwards three times, and I saw mountain of corpses covered in human blood and above them Angels were flying. They were taking the souls of those murdered for the Word of God to heaven while they sang, Alleluia!’ I observed all this and cried loudly. So we entered into the church, and it was full of people. I saw an altar on which tallow candles were burning. On the altar was a king in red, blazing, porphyry. On his head was a golden crown with a star. I asked the starets, ‘Who is this?’ He replied, ‘The Antichrist!’ He was very tall with eyes like fire, black eyebrows, a wedge-shaped beard, a ferocious, cunning, evil, and terrible face. He alone was on the altar and he reached his hands out to the people. He had claws as those of a tiger for hands and he shouted, ‘I am King. I am God. I am the Leader. He who does not have my seal will be put to death.’ All the people fell down and worshipped him, and he began to place his seal on their lips and on their hands in order that they should receive some bread and not die from hunger and thirst. Around the Antichrist his servants were leading several people whose hands were bound as they had not bowed down to worship him. They said, “We are Christians, and we all believe in our Lord Jesus Christ!’ The Antichrist ripped off their heads in a flash and Christian blood began to flow A child was then led to the altar of the Antichrist to worship him, but he boldly proclaimed, ‘I am a Christian and believe in our Lord Jesus Christ, but you are a minister, a servant of Satan!’ ‘Death to him!’ exclaimed the Antichrist. Others who accepted the seal of the Antichrist fell down and worshipped him. Suddenly roar of thunder resounded and thousand lightning flashes began to sparkle. Arrows began to strike the servants of the Antichrist. Then a large flaming arrow flashed by and hit the Antichrist himself on the head. As he waved his hand, his crown fell and was crushed into the ground. Then millions of birds flew in and perched on the servants of the Antichrist. 24. As Christians, we need to cleanse ourselves through deep repentance, a change of life, and guard ourselves with prayer, fasting, and self-denial, make amends by good works, and nourish our souls with the teachings of the Holy Fathers. 25. A believer can reach the Heavenly Kingdom only through a sober, Christian life, according to the teaching of the Holy Fathers. A very central part of Christian life is repentance. Without repentance, no one can be saved… Thank God that the Church accepts sinners! 26. God forgives those who repent sincerely. We must also forgive our brothers who may sin at one time or another through the deception of the devil – whether on a personal level or a societal, political level. This is a commandment of God, which each Christian is obligated to fulfill. If we do not forgive our brothers’ sins, we sin gravely. We are not obliged to agree or accept every one of our brothers’ opinions, but we are required to live in love. 27. In today’s difficult situation, we must pray sincerely for one another, and treat each other with great love, in order to save our souls through love. Separating from our brothers on account of any opinions, apart from heresy is not an option for a true Christian. Christ died for these brothers. 28. And so, what should we do? We should be humble, and obediently submit to the Church. The Church is our first and most dear homeland. Only after this spiritual homeland are we citizens of specific countries, and members of specific nations. 29. You who love Russia, and believe She has a special, God-given place in the history of mankind! Perhaps you sense Her time of great significance has come? The unbelieving, apostate west does not understand, and appears to be attacking Her! 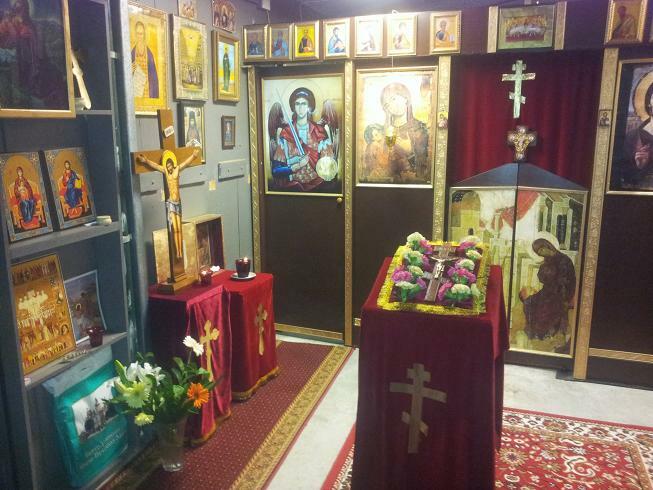 Russia is, after all, the portion of the Mother of God on earth. However, there is a possibility you still could be experiencing an attack from the Evil One. Remember, these prophesies are conditional. Russia will not have the spiritual strength to take a special part in the history of mankind if Her people do not repent and return to God. Brothers, stop and calm your souls. Yes, your view grows from love for Holy Russia, which you perhaps believe only exists in a spiritual sense today…You are following the opinion of many fathers of the Russian Church Abroad. Yet there is a possibility you still could be experiencing deception. 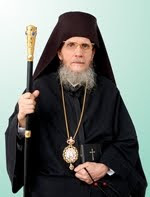 If you do not repent and live a conscious spiritual life, the fact that you have been nourished by the Russian Church Abroad will not help you. Encouraging people to fight against the God-fighters is worth nothing if you yourselves are shown to be God-fighters, within your own souls, in your families, parishes and communities. Brothers, stop and calm your souls. Yes, you understand that we have no one but God to deliver us. However, remember that you could nevertheless be under deception regarding other aspects of your beliefs. You also must live as true Christian, according to the rules of the Holy Church. You must repent , pray, learn about the Church and all Her soul-saving practices, and not remain engrossed in the study of the manifestations of evil. Study good instead of evil, and most especially, perform good, acquire the practical virtues. 32. Brothers! Your beliefs are not all incorrect. However, we must all realize that our first priority is our personal spiritual work, repentance, partaking of the Holy Mysteries, acquiring Grace. Understanding the world and our times, and knowing what influences our society and surroundings is – secondary. This secondary knowledge sometimes inspires beginners in the faith to turn to God. It is important to understand that even if such knowledge perhaps formed our first steps toward God, this knowledge should not be the end of our path. We must grow. The end of our path is holiness, God-likeness, in eternity. Do you personally repent deeply? Do you personally live up to the Law of God? Is your heart always at peace and full of love? Are you constantly in communion with God? Do you love those who think differently? Can you exist in the one Church with them, tolerating their thoughts? Can you exist together with your brothers, without condemning their enthusiasm for the one or the other party? Or would you rather cleanse the Church from such ignorant ones? Our view cannot be perfect – it is partial. 35. Love is not passionate and emotional. True love is self-sacrifice. Let us with patience bear one another’s weaknesses, and preserve brotherly love. 36. The Christian may not yet be able to keep total peace in his soul in the heat of the current discussion. In this case, he should be very careful not to speak (or write) against his brothers. 37. The believer can and should remove himself from temptations that he senses are too great for him to endure. However, this is merely a physical separation, and never a spiritual break. A Christian should not separate spiritually from the souls of those brothers that cause temptation to his weak soul– he should never consider leaving the Church. She is the Mother of us all, and the only Vessel of Salvation. How will we reach the Kingdom of God if we abandon the Church, which is the only Ship that can bring us there? 38. In modern times, removing oneself from temptation includes not reading opinions of brothers in Christ, including on the internet, if the believer knows that these opinions upset the peace of the soul, hinder prayer, shake his fidelity to Christ, and his hope in God’s Providence. When we do not know beforehand, but start to read or watch something, and then feel in our heart and soul that this is causing us temptation, we should stop, pray, and resolve to not expose ourselves to this temptation. Whoever seeks the Lord must remove himself from the world. By “world” is meant everything passionate, vain or sinful that enters into personal, family and social life, and which becomes the custom and rule. (…) Citizenship and family life are blessed by God, therefore we should not turn away from them or have contempt for them, nor for anything belonging to their essential good order. By everything lustful or passionate that has come into them like a malignant tumour that tempts them should be held in contempt and renounced. (…) The vain, passion-soaked world is inevitably transmitted to our souls, and arouses or infuses passions. 40. In order to preserve our spiritual life, we should follow St Theophan’s advice. If we do not preserve ourselves from sin, all our knowledge of evil in the world will be useless. We should nevertheless consider leaving these habits for the sake of conducting a more thorough investigation of our own souls, and God will give us all that we need, as He is the God above everything. Let us guard our mind with humility, not allowing it to rush indiscriminately towards the acquiring of knowledge, however much their novelty and importance are attracting our curiosity….At first, the narrow path of obedience to the Church is sorrowful; but it will lead us to the expanse and freedom of the spiritual mind, in which will disappear all the supposed incongruity, which the fleshly and emotional mind finds in exact obedience to the Church. How does the current civil war in the area of the world known as Ukraine relate to Russian patriotism and anti-communism? How does it relate to the battle between good and evil, between God and Satan? This question is troubling many in the Russian Church Abroad. The answer is not simple, and many have attempted to state it. Ultimately, the answer must be spiritual, not tainted by sin or earthly passion. 1.There exists a struggle between good and evil. That is, between God and the evil one. This struggle began before the creation of man, with the fall of Lucifer. It continued by implicating man – first of all, Eve, Adam, and later, every one of their descendants. 2.All current and past political conflicts are very much part of this battle. 3.The devil is a bodiless being that has not died (although as a spirit, he is not by nature immortal). His nature is such that he has gained immense experience in how to deceive humans. Due to demonic influence, our human reasoning is usually tainted by evil to some degree. This applies to all forms of conflict, and most especially, to war. 4. Most people are implicated in evil unconsciously. However, some people choose to serve evil consciously. Such are magicians, sorcerers, fortune-tellers, Satanists, masons, members of other secret societies that serve evil. It is important to understand that such secret societies with truly evil agendas have great power in the modern world (as they have had for hundreds of years). This power may be hidden to many simple people. Both spirits and men who serve evil usually strive to hide this service, so that their victims – those who wish to serve good (Christians) – would be deceived into serving evil. 5.Christians must always strive to be in God, with God, and for God – for good. But how do we know what is good? 6.The world is not simple. Spiritual reality is very much a part of the “real world”, to such an extent that evil spiritual deception clouds our understanding in most, if not all areas of life. 7. The Gospel and the Tradition of the Church can tell us what is good. For man, it is good to prepare his soul for Heaven, through good works (as defined in the Gospels) and repentance for evil deeds, thoughts, and feelings. 9. Earthly movements (such as political movements) are never fully good – they are of this world, and this world lies in evil (1 John 5:19) This world is becoming more and more evil, as we near the end of time. 10. The closest an earthly government can be to fulfilling God’s will, is the case of an Orthodox Kingdom, with a pious Tsar or King crowned by the Church by the will of God. This is the teaching of the Orthodox Church. However, we have not had this organisation of government for a long time… The Byzantine and Russian Empires are well-known examples of Orthodox Kingdoms. Unfortunately, after the February revolution of 1917, the Holy Synod agreed to change these texts, replacing the “Pious Ruler” with “Orthodox Christians. St John of Shanghai and San Francisco opposed this innovation, because the texts acquire a subtle difference in meaning, which again leads to people thinking differently regarding authority, about good and evil. What inspires our political ideas? 13. Today, many Orthodox Christians are being deceived by the evil one into thinking that one or the other world power, or government, is ultimately on “the side of good” against evil. This stance is unfortunate for Christians. If Orthodox Tsars fell, then how much more vulnerable are modern atheist politicians to succumb to evil? 14. Many consider it important to write about their opinions. The enemy persuades people that they understand what is happening, that they have the “correct information” from the most “reputable sources”. Alas! The Christian does not realize that the evil one is playing with him, working him up over things of this world. The nets for my mind are set out in various books calling themselves light, but containing teachings of darkness, written under the open or hidden influence of dark and evil world ruler…as the Apostle expresses it: “vainly puffed up by his fleshly mind” (Col 2:18)…. 15. Some Christians, of various convictions, would even force their political opinion on the Church. They demand statements from the Church in favour of one or the other side of conflict, of a government or ruler. In this case, the Christian has unconsciously made his political view an idol, which he wishes the Church would also serve. 16. Political and worldly opinions are not forbidden for a Christian – however, he is obligated to understand that the Law of God, love for every brother (regardless of this brother’s opinions), and obedience to the Church come before any political opinions. 17. The Evil One has always been at work to deceive the people of God. Even more so in the last times. Christians have always been of the opinion that it is the last times, and that a great struggle is occurring between God and Satan. 18. The Church teaches that the world most definitely will end – when, we know not and cannot know. However, the closer we come to the end of the world, the more evil the world will become, and the less will worldly movements have fellowship with God. In the end times, Satan controls all nations – he is the one who guides all sides of any conflict. Taking sides becomes senseless. 19. The Christian’s aim is to abide with God forever. Our exit from the world may be through death, or through the end of the world – in either case, we will have to personally answer for our deeds, as judged by the Gospel. The Holy Church commands us to repeat this prayer numerous times every day. The Holy Church teaches this because She knows that temptation and the devil are very real forces influencing every person, every group of people, every parish, every city, nation, and country. 21. Therefore, every Christian must understand that he is subject to temptation. If a Christian believes his political view of the world is without sin, and that only others are deceived in their political views, this very fact is proof of his own deception. Spiritual deception is a multifaceted and more complex than the simple form of misinformation, or dishonesty of biased journalists. 22. If we fall prey to the evil one’s schemes, be it on the fleshly, psychological, social, or political level, we are in the process of falling away from God, even if we at first accepted Him and were baptised. Those who fall away from God, if they do not repent, will be condemned…Let us not be as these ones, who do not see temptation, and when they happen to fall into it, pridefully refuse to repent! …..“And have no root in themselves, and so endure but for a time: afterward, when affliction or persecution ariseth for the word’s sake, immediately they are offended. 23. Only at the Great Judgment will it be clear who remained faithful to God, and who did not. It is not for us, blind and deceived sinners, to define which ones of our brothers is a sinner and deceived. The feast of the Protection of the Mother of God is a parish feast of the Russian parish in Yarraville. Since it was a working day not too many people were able to come. However the feast went well, in joyous atmosphere. After liturgy, there was a moleben with a procession around the church. Then all proceeded to the hall for a festal meal. 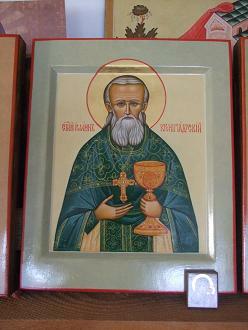 Today, 4/17 October 2014, at 4 am, Anna Zhukov, parishioner of the Tabinsk Icon Community, reposed in the Lord. She was 99 years old, and a faithful member of the Russian Orthodox Church Abroad to the end. As a young girl, Anna fled Russia to China with her family in the 1930’s. In the 60s the family fled China and emigrated to Australia. She remained adamantly anti-Soviet all her life. 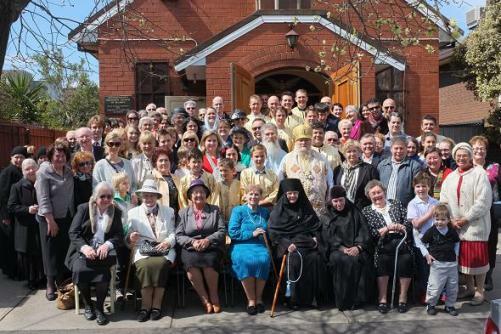 She understood the significance of the 2007 “union” of part of our Church with the Moscow Patriarchate, and took no part in it. She instead attended divine services with clergy who had remained faithful to the principles of the Russian Orthodox Church Abroad. She was known and respected in the Russian community in Dandenong. Please pray for the repose of the soul of the servant of God, Anna.